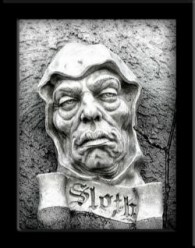 Sloth has been considered one of the seven deadly sins for much of Church history. It can be described differently when viewed from different angles. In the world, it can call “itself Tolerance, but in hell it is called Despair,” according to Dorothy Sayers. It is the accomplice of the other sins and their worst punishment. It is the sin which believes in nothing, cares for nothing, seeks to know nothing, interferes with nothing, enjoys nothing, loves nothing, hates nothing, finds purpose in nothing. lives for nothing, and only remains alive because there is nothing it would die for. Sloth is the ultimate sin of omission: sloth sits still, unmoved by anything real. Sleeping through a movie may not be deadly, but sitting on your hands while the cinema is burning around you certainly is. We must guard against sloth, the temptation to be lulled to sleep when there is something urgent to be done. Is there a cure for this spiritual narcolepsy? There is. In seeking out this cure, Dr. Vanhoozer turns to the life and work of C. S. Lewis. More specifically, Vanhoozer sees Lewis’s use of the imagination as an antidote to spiritual sleepiness. Those who follow Jesus Christ have been … jolted awake … by having descend on them tongues of fire. Remember the words of John the Baptist: “I baptize you with water. … He will baptize you with the Holy Spirit and fire” (Matthew 3:11). The Spirit of Christ burns in our hearts, awakening us to the presence and activity of Jesus Christ. Sleeper, awake! In the remainder of this longish article, Dr. Vanhoozer explains the important relationships among theology, discipleship and the imagination. Please take time to read this insightful article in its entirety. “In Bright Shadow: C.S. Lewis on the Imagination for Theology and Discipleship” is the title of Kevin Vanhoozer’s article, which was originally given as a conference talk. Video, audio and text are available here.